Seattle is a place unlike any other. Minutes from the water and a short drive to the mountains puts Seattle residents in the heart of nature with the convenience of city living. A temperate climate allows for year-round activities just steps away from many of the city’s hottest spots including hiking, golfing, and skiing. Cultural activities abound and the city’s residents are able to enjoy world class theater, up-and-coming art exhibitions, and moving musical performances. Seattle offers something for everyone wanting to get out, escape, and explore! Seattle offers a wide variety of exciting outdoor adventures available throughout the year. Regardless of the season there is always something to explore. Hit the Slopes! Crystal Mountain is just a short drive from Seattle and is located in the shadow of magnificent Mt. Rainier. Skiers can escape for a day trip or take advantage of the resort’s popular Stay ‘N Play packages. Seattle is a hiker’s paradise. Hikers can explore canyon country, river gorges, alpine slopes, and golden larches. The beauty of the surrounding mountainscapes offers unparalleled hiking twelve months a year. The waters of the Puget Sound provide an endless amount of water sports and activities. Kayaking, parasailing, stand-up paddle boarding, and boating all help fill residents’ days on the beautiful blue waters. Seattle residents are proud of the local commitment to the environment. Locals participate in all types of earth friendly practices such as composting, recycling, utilizing public transportation, and green building techniques. Nearly 6 million riders utilize Washington State’s ferry system each quarter. That’s approximately 24 million riders, both passengers and vehicles, each year! This reduces the number of vehicles on the road and helps protect the environment as people travel throughout the Seattle area. The Seattle real estate market offers residents a variety of home sizes and styles and has plenty of beautiful neighborhoods to choose from. When searching the area for homes many residents discover that Seattle doesn’t have a distinct style, instead offering a mix of homes including Craftsman bungalows, modern view properties, contemporary lakeside retreats, and rustic log cabins. 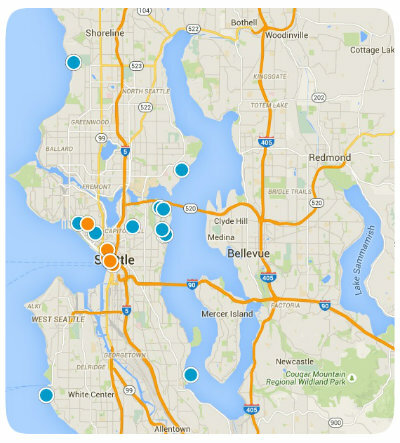 If you are interested in more information about the Seattle real estate market explore our available listings. Newcastle: The Golf Club at Newcastle is spread out among 350 breathtaking acres boasting panoramic views of Mt. Rainier, Lake Washington, both the Cascade and Olympic Mountains, and the City of Seattle. The club features two 18-hole courses, Coal Creek and China Creek, a 44,000 square foot clubhouse, and magnificent practice facilities. The Golf Club at Newcastle is nestled in the quaint town of Newcastle. This area was once known for its coal mining and once fed the energy needs of early settlers to the area. Now it maintains the feel of a small town community close to all of the amenities Seattle has to offer. Woodinville: Located in Woodinville, a community northeast of downtown Seattle, the Bear Creek Country Club offers members unparalleled amenities including the Jack Frei championship golf course. Members can also enjoy the well-appointed clubhouse, fitness club, member events, and practice facilities. Woodinville sits between two historic and scenic rail lines which once provided essential transport services throughout the state of Washington. Today, Woodinville is known for its excellent public school system, its proximity to the Cascade Mountains, and an abundance of outdoor activities. Medina: The Overlake Golf Club is located near the shores of Lake Washington and has been a popular golfing destination since 1927. The original course was created by famed course designer Frank James and the traditional layout of the course and grounds fuels both nostalgia and camaraderie. Overlake Golf Club also offers members access to its tennis courts, swimming facilities, and world class dining. Medina is located northeast of Seattle in suburban King County and is surrounded by Lake Washington on three sides. Medina has the third highest per capita income in the state and the 49th highest in the country. The Seattle metropolitan area is known for its diverse cultural opportunities including the Seattle Art Museum, Broadway in Seattle, the Seattle Symphony, and numerous art galleries. The unique art form of glassblowing is brought to life throughout the Pacific Northwest and has found a home in Seattle. This interactive art experience invites residents to watch artists work in local hot shops and enjoy these one-of-a-kind pieces in their homes. There are three National Parks within driving distance of Seattle; Mt. Rainier National Park, Olympic National Park, and North Cascades National Park. All of these parks are testament to the beauty of the area and the unique recreational opportunities located in our country’s National Park system. The Seattle area is known for its world leading tech industry and is home to such giants as Amazon, Nintendo, and Microsoft. Up and coming companies like Apptio and Groundspeak continue the tradition of world class tech and Internet companies based in the Seattle area. These companies employ a variety of residents in careers ranging from technical support, engineering, design, and marketing. Seattle is also known as “Jet City” for the importance and impact of the air travel industry. Boeing has made its home in the Seattle area for over 100 years and continues to be a leading area employer. Alaska Airlines also has its corporate headquarters in Seattle and owns a major market share of flying on the west coast, to Alaska, and to the Hawaiian Islands. Seattle offers a lifestyle awash in beauty, outdoor adventures, and cultural opportunities. 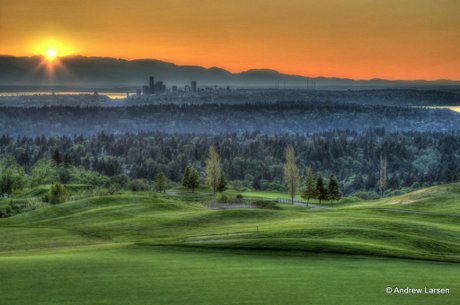 Whether you want to hit the slopes, catch a show, enjoy a round of golf, or relax at the water’s edge this picturesque city in the Pacific Northwest offers it all.